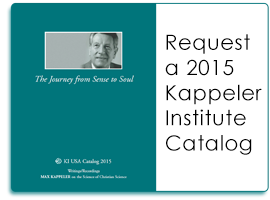 Max Kappeler founded the Kappeler Institute for the Science of Being in 1973, with the mission to publish, promote, and archive his English language writings and recordings. The activities of the KI USA are primarily focused on bringing Kappeler’s work to a larger worldwide audience, and to continually improve study materials for new and longtime students. Our goal is to make sure that every interested student has access to the materials they need to study Science. The Kappeler Institute for the Science of Being is a nonprofit, tax-exempt 501(c)3 corporation according to the code of the Internal Revenue Service of the United States, and is incorporated in Delaware. The current working office is located in Seattle, WA. The KI USA exists for educational and research purposes. The Christian Science that Mary Baker Eddy discovered and stated in her Textbook, Science and Health with Key to the Scriptures, is seen to be the universal Science of all sciences. The denominational aspect of Christian Science is fading away, and its vital role as a proto-science is emerging. Science cannot be organized and its investigation cannot be outlined or controlled humanly without endangering its unfoldment. Max Kappeler based his research entirely on the Bible and the teachings of Mary Baker Eddy as the complete revelation of Christian Science, as well as the teachings of John W. Doorly, who detected the scientific system of reference in the Christian Science textbook. The Kappeler Institute USA claims no exclusive rights to the term “Science of Christian Science,” nor does it present itself as an authority to endorse, control, or regulate work on this subject.